Have you ever looked at a diamond and wondered why some diamonds are more attractive than others? While some are bright and flash with a rainbow of colors, others look dark and lifeless? These differences are all based on the cut and shape of a diamond. Cut grade fuels a diamond’s overall visual appeal in fire, sparkle and scintillation. 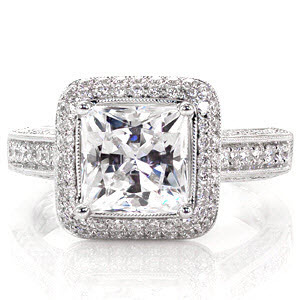 The light behavior within a diamond directly correlates to how well a diamond is cut. GIA recognized this relationship of a diamond’s cut and the quality of fire and the return of white light. Developing a grading system that quantifies specific measurements, angles, and percentages GIA was able to determine parameters that embody the best qualities in the cut of a diamond. GIA began their 15 year study on the round brilliant by creating a computer model to examine light behavior within a diamond. Developing proportion-based metrics from this model they were able to predict a diamond’s performance on fire and brilliance. However, research proved that computer-based results could not be the only determining factor in judging a diamond’s overall brightness. After surveying industry leaders and general consumers, GIA created a foundation for the round brilliant cut grade. When a cut grade is given, it is the component of brightness, fire, scintillation, polish, and symmetry, as well as durability and weight concerns. 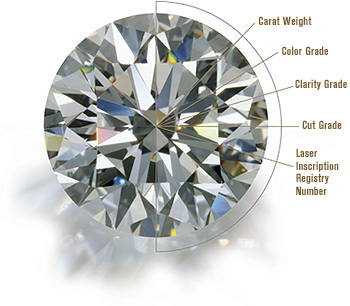 These are all an integral part that make up the GIA diamond cut grade system. With many different proportion combinations possible, GIA was able to determine the relationship of a stone’s interaction with light. The reflection of light internally and externally in a diamond is called it’s brilliance. Fire is the dispersion of spectrum colors you see when light hits the diamond. The pattern of light and dark areas and the flash of light that emits when a diamond is moved is called scintillation. A well cut diamond will attribute to these three desired qualities because it directs more light through the top of the stone. 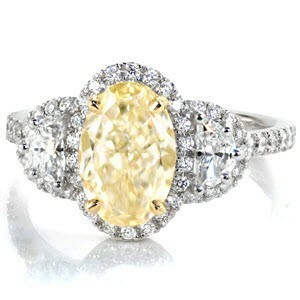 A poor cut will appear dark because light is exiting through the bottom of the stone if it is too deep or too shallow. 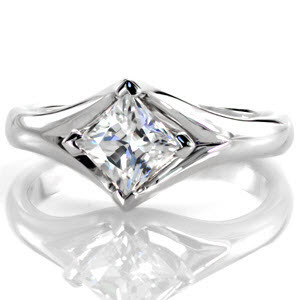 Diamond cut is often confused with its shape. 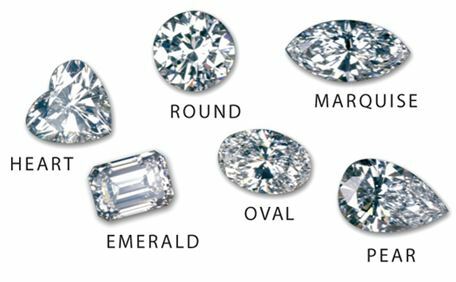 Round, used in most diamond jewelery, is the shape of a stone. All other shapes are classified under fancy shapes. Evaluated only on polish and symmetry, fancy shapes do not receive a cut grade like the round brilliant. These grades are valued ranging from Excellent to Poor. Polish is rated on the overall surface condition of a diamond’s facets. It is the result of the polishing process and blemishes created after cutting. These grades are given to a diamond when viewed under 10X magnification. An Excellent or Very Good may have minute or minor features that can only be seen with the aid of a microscope. Anything Good or lower can affect the appearance of a diamond and may be seen by the naked eye. Symmetry is the exactness of shape and placement of the facets. It is subdivided into two types of features, proportion-related and facet-related. These grades are also performed under 10X magnification for its initial face-up impression and profile view. Both angles are evaluated because of the three dimensional nature of a diamond; one symmetry feature can be linked to others. Similar to polish, grades given Good or lower can have symmetry features that are noticeable to the unaided eye. 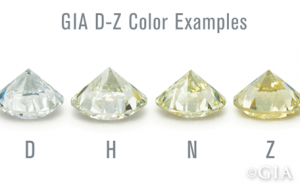 Understanding GIA parameters for each grade and the specific guidelines they represent, Knox Jewelers recommends fancy shapes to be Good or Better. With almost 30 years of industry experience, we have found that the beauty of a diamond is greatly reduced when selecting polish or symmetry below this standard. 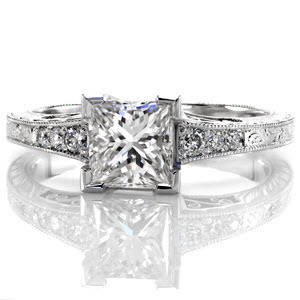 A diamond that contains Good or Better qualities enhances the elegance of a handmade Knox custom design. 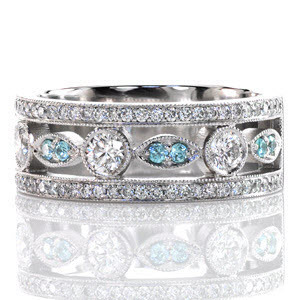 The care and craftsmanship that goes into each ring is harmonious to the quality of diamond a customer chooses. 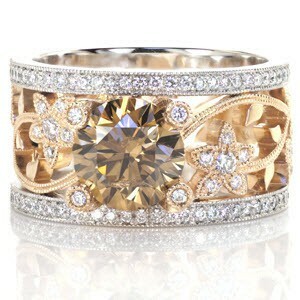 As the focal point, a diamond captivates the attention with its radiance of sparkle and luster. Selecting a well cut stone to compliment a Knox diamond engagement ring is a timeless expression of love, forever evoking a sense of glamor and romance. Could you imagine going into a car dealership purchasing what you thought was a 6 cylinder luxury performance car, only to discover it was actually a 4 cylinder engine with the body of a sports car. This misrepresentation would never occur in the auto industry. However falsely identified diamonds are common in the jewelry industry. The idea that all diamond laboratories are created equal is not the case; while most labs use the GIA diamond grading scale, not all have the same level standards to adhere to it. Many industry leaders have tested this known truth of variable diamond grading standards by sending the same diamond to different labs and getting very different results. Rapaport, an international network that provides an overview of the diamond market, recently preformed one of these studies using 10 diamonds. The diamonds were sent to different grading labs in the US and abroad. The outcome proved that some diamonds could differ as much as three color grades when graded at multiple labs. The biggest difference in these grading reports were American labs verses international. Surveys found grading labs in the US, including GIA, IGI, and EGL USA were fairly close in their grading standards. However, EGL USA generally graded the diamonds much more lenient than the other two labs. Another discrepancy in the diamond reports were the laboratories overseas, including EGL Israel and EGL Hong Kong. This is when they found some diamonds two to three color grades off when compared to diamond reports from the US. Antwerp’s HRD lab was slightly softer in grading when analyzed to GIA standards. So many labs are speaking the same diamond language but each with varying interpretations. How is a consumer to know they are truly purchasing an “E” color diamond and not an “H?” The biggest safeguard for a consumer is to be educated on diamond quality. At Knox, educating our customers on the 4C’s and showing how to identify differences in quality is how we maintain consumer confidence. Once you can detect a colorless diamond from a near colorless diamond, you will gain the security of knowing how to select diamond color. 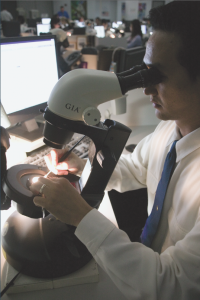 Knox Jewelers will spend time with you, going over internal features of clarity characteristics using a microscope or loupe; helping to understand the clarity scale and what that represents in a diamond. During a diamond consultation we express the importance of a well cut diamond and how that relates to the overall beauty of a stone. At that time, we emphasize how to select a diamond size based on its dimensions and not by carat weight alone. By knowing what diamond characteristics to look for, customers have the knowledge in determining the true nature of a diamond and if the lab certification is accurately supported. Most diamonds are laser inscribed on the girdle of the stone, this is the outer edge that separates the top and bottom portion of a diamond. This inscription is a sequence of numbers and letters that identifies the diamond with the laboratory’s certification report. If this inscribed code coordinates with the lab report number, customers can be confident the information being presented is genuine. When evaluating the authenticity of a diamond report, it is important to understand who is certifying the stone. GIA was the pioneer in establishing the grading scale and providing third party verification on diamonds. Their strict grading procedures is well respected in the jewelry industry. With this reputation, high quality diamonds are sent to GIA for certification. While diamonds of lower value are sent to labs with soft grading practices in an effort to achieve higher diamond grades than GIA would evaluate the diamond at. 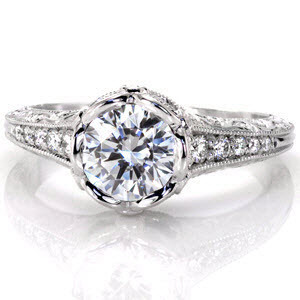 With this understanding, Knox Jewelers prefers the highly recognized, honest services provided by GIA. 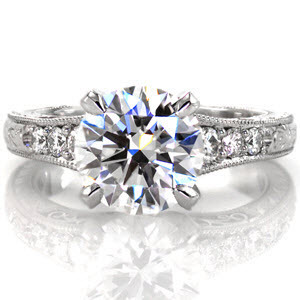 We choose not to sell diamonds that are overly generous in their diamond evaluations. As a small, locally owned business located in Minnesota we wholeheartedly believe in the integrity of our family jewelery store. GIA is the world’s most trusted name in diamond grading. In line with Knox Jewelers higher level of standards, GIA ensures the integrity and accuracy of every report it issues with objectivity and expertise. To display the very best of diamond attributes, choose a GIA graded diamond for your Knox ring.